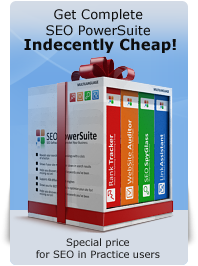 I got to know this site after downloading SEO Powersuite. Thanks for sharing your tips. I will say you seem to have the most comprehensive all-around approach I've seen, the past year in trying to transition from corporate world to internet. It's not an easy transition much like Mars. v. Venus. Is there a way to buy your guide as a file or ebook? It would be great to read it offline. I went through this course and decided to come back and take it over again. 1. I'm too lazy to spend a lot of time writing content for my website, so I thought I would justify my wasted time by reading up on SEO, even though I don't actually need to. 2. The course is well writen. 3. Paying attention to the basics is the constant duty of anyone who desires success. Actually, the last of the three reasons is why I'm reviewing the material. This is very exciting to have all the information together like this. I'll be reading your book this week, eagerly looking for any SEO help I can get! Thanks so much for your wonderful effort in writing this Seo Book for us! Thank for writing this ebook, it is fantastic. I have implemented some of your suggestions and the traffic to my site has increased greatly. The only thing I would like to mention is that it does take time for the search engines to recognize all the optimization work you do. So don't be worried if it takes a few months to jump up in the rankings. I think you have hit on many great practices that the newbe needs to learn. Why does it only give lower scores when you complete the tests with no wrong answers?